Born in Huntington Park, California, the youngest of six with 5 older sisters, which may explain why he never left the toilet seat up! He was very enterprising from a young age and held many jobs; a paper boy, box boy and a grocery checker. Sandy then joined the hippy movement and moved to Haight Ashbury, listened to the Grateful Dead, and drove a Chicken Delight truck for work. Then Uncle Sam called and he spent 2 years in the Army, and later went to school on the G.I bill at Cal State Fullerton, received a B.A. degree in Anthropology and later met the love of his life, Helen. A devoted husband for 40 years and father to two beautiful girls, Kelsey and Karlyn, he was the best supporter anyone could ask for. Always going over and beyond, from making coffee in the morning to fire places at night. His secret love for old classic Broadway musicals was a good transition to 20 years of attending his daughter’s ballet performances and dance competitions. The adventurer that he was, he took his family on the best of the best trips around the world. From swimming with manta rays in Hawaii to the flying trapeze in Turks and Caicos to monkey chasing in Malaysia to Tequila tasting in Mexico to ATV’s in Aruba and snorkeling the Great Barrier Reef. The adventures were endless. These adventures ultimately led him to a new sense of adrenaline: The IRONMAN RACE- a 2.4 mile swim, 112 mile bike, followed by a full 26.2 mile marathon. Sandy approached this new found Swim, Bike, Run athletic event at the age of 60, despite the fact he didn’t know how to swim! His type A personality combined with passion, drive and enthusiasm were the perfect mix for a triathlon. He found a supportive new community of friends and training partners taking part in the SBAA Running Club, the Master Swim Club and his infamous Sunday Bike Crew. Also a member of the Santa Barbara Triathlon Club, he quickly became a fixture at Club meetings and weekly training sessions with the club. He was a generous business sponsor and promotor of running and tri events. It was not uncommon to have a conversation or receive an email from Sandy outlining the top three reasons why you should sign up to compete in a race with him at some exotic destination. One great benefit to racing with Sandy in distant locations was simply to be invited to the sendoff barbecue at his beautiful home, alongside the Hostess with the Mostess, Helen. Sandy’s constant focus to improve would ultimately result in an impressive list of athletic accomplishments. 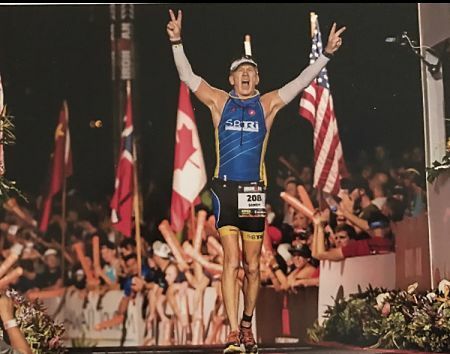 He began to dominate the local sprint and Olympic distance races, often winning his age group, and then set his sights on his ultimate goal: The Ironman – Sandy completed his first Ironman in Arizona, followed by the North American Ironman Championships in Mont Tremblant, Canada, with a podium finish. With that success he achieved the ultimate Ironman goal: The World Championships in Kona, Hawaii. Sandy chose Ironman Canada at Whistler as his qualification race, claiming first place in his age group therefore obtaining a starting slot at the World Championships in Hawaii. He raced and finished at the World Championships, achieving 12th in the world in his age group. In that same year Sandy also qualified for and competed in the Ironman 70.3 Puerto Rico which qualified him for Ironman 70.3 World Championships in Australia. He qualified and raced in the Boston Marathon, swam the “escape from Alcatraz” open ocean race, all after learning to swim at the age of 60. *Sandy was scheduled to race the St. Croix ½ Ironman on May 7th with 3 of his friends who will now be doing it in his honor. His wife and 2 daughters will also be attending to represent his true spirit of passion and dedication to life.